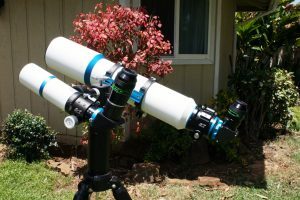 In 2017, I picked up two new William Optics telescopes: a Twentieth Anniversary Edition Fluorostar 132 (132-mm f/7 triplet Apo) and a Zenithstar 61. In a previous article, I reviewed the Fluorostar 132. Here, I will review the Zenithstar 61 (hereafter referred to as the Z61). The is William Optics’ newest and most compact apochromatic refractor. The telescope has a 61-mm f/5.9 objective, yielding a focal length of 360 mm. The doublet objective uses FPL53 glass (Image 1). This is one of the lowest indices of refraction glasses made and comes very close to fluorite in its optical dispersion properties. Using this synthetic fluorite glass allows the Z61 to achieve excellent color correction with just two objective elements. storage case is made of hard plastic and has foam cut out perfectly in the shape of the telescope to protect it during transportation. Image 2 shows just how compact the Z61 is when the dew shield and focuser are both retracted. The telescope is approximate 10 inches (254 mm) in length. It’s lightweight, too, weighing a mere 3.2 pounds (1.45 kilograms). With the dew shield fully extended and the focuser cranked out all the way (Image 3), the telescope (without any accessories attached) expands to nearly 15 inches (380 mm). 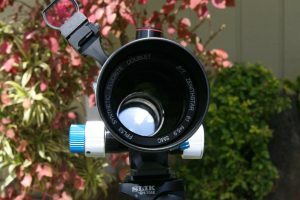 Besides the OTA and the case, the telescope comes with a rotating ring with a small dovetail bracket, a metal tube cover, a finderscope shoe, and a 2-inch to 1.25-inch RotoLock adapter for locking in 1.25-inch accessories. The telescope does not come with a mount, star diagonal, finderscope, field flattener or eyepieces. Fortunately, I already have an inventory those accessories. and is graduated in millimeters with large ticks and numbers every 10 mm. Fully extended, the focuser is rigid with no flexure. The focuser turns very smoothly and there is a setscrew to lock the focuser in place. Image 5 shows the Z61 along with the Fluorostar 132 on a Twilight II alt-azimuth mount. I have removed the RotoLock adapter and have inserted a 2-inch diagonal with a massive 2-inch eyepiece. The Z61 has three setscrews for securing the diagonal into the focuser. These models have blue trim. However, they can also be ordered with red or gold trim. Note the dial with a needle inside the left focus knob. This is a thermometer that reads in both Fahrenheit and Celsius. 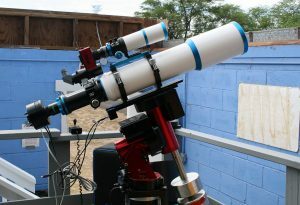 For terrestrial viewing, the telescope can be attached to a standard camera tripod, since it has two 1/4-20 taps on the small dovetail bar (Image 8). For celestial use, the telescope is a perfect match for an iOptron Cube Pro mount (Image 9). The combination yields an extremely portable airline travel telescope and mount set. 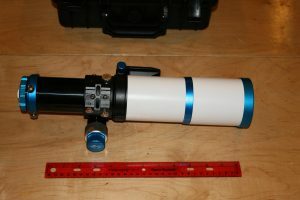 Image 9 shows the telescope with a 1.25-inch diagonal inserted into the RotoLock adapter with a 25-mm (14x) Plössl eyepiece. I also inserted a red-dot finder into the finderscope shoe. 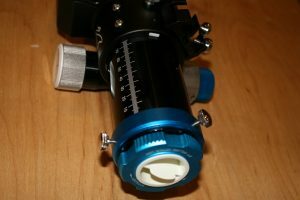 I should note the finderscope shoe can be attached onto the top right or top left side of the focuser. Everything shown in this image, including the tripod, fits into a standard carry-on bag, without exceeding allowable carry-on weight restrictions. Out in the field, there is no need for any finderscope other than a red dot for general pointing. With a 25-mm, 50-degree Plössl eyepiece, the true field of view is 3.6 degrees, making it easy to center a target object. 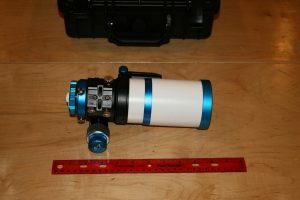 Most of my observing is done with a 13-mm Tele Vue Ethos eyepiece, which gives 28x and 3.6 degrees, and a 4.8-mm Tele Vue Nagler eyepiece yielding 75x with a 1.1-degree field. The Z61 is great for viewing extended objects such as the Pleiades, M44 and Orion’s Sword. The Andromeda Galaxy with satellite galaxies M32 and M110 are easily captured. The telescope is excellent for exploring lunar craters, as the full aperture does not collect a blinding amount of lunar light unlike larger telescopes. At 75x with my 4.8-mm Nagler eyepiece, Jupiter’s belts and zone, along with its Galilean moons, are clearly visible. So are Saturn’s rings and its moon Titan. There was no hint of false color visible around the moon or planets, attesting to the excellent color correction of the telescope. To test the telescopes astrophotography potential, I attached it piggyback atop the Fluorostar 132 on my Paramount MyT German equatorial mount in my club’s observatory (Image 6). To secure the telescope to the blue plate, I used both 1/4-20 taps on the bottom of the telescopes rotating bracket. I attached a 0.8x focal reducer/field flattener with appropriate spacers to an SBIG-8300C CCD camera and inserted it into the Z61’s focuser. Autoguiding was accomplished with the CCD camera attached to the larger refractor. The 0.8x focal reducer yielded a 288 mm focal length at f/4.7. At the end of twilight, a small crescent moon was still high in the west. 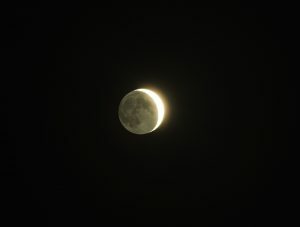 With a one second exposure, I captured the Earthshine visible in Image 7. After moonset, I decided to try some deep-sky imaging. 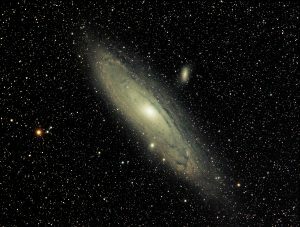 My first deep-sky target was M31, the Andromeda Galaxy. This size refractor perfectly frames M31 on the camera’s CCD. I intended to image M31 for 120 minutes with 10-minute subframes, but clouds kept interfering, and I only managed to get four good 10-minute images. To my surprise, the combined 40-minute exposure resulted in an excellent picture of M31 (Image 8). The telescope captured Andromeda’s spiral arm structure and dust lanes quite thoroughly. M32 and M110 are also sufficiently present. M31 star cloud known as NGC206 is also clearly visible halfway between the galaxy’s core and lower right (southwest) edge! 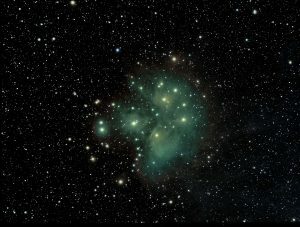 After shooting M31, I turned the telescope on M45, the Pleiades. Again, this size telescope is perfect for framing the M45. Image 9 is a result of a 60-minute exposure. The Z61 beautifully captured the seven sisters, their scores of cousins, and the swirling clouds of gas out of which they all formed. The Zenithstar 61 is a beautifully-crafted telescope that can be used as a grab-and-go instrument for local star parties or intercontinental travel. Views at the eyepiece are superb. In addition, the telescope is excellent for imaging large field-of-view celestial objects. Its fast optical system captures faint objects with relatively short exposure times. 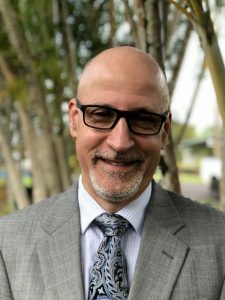 Dr. James Dire has an M.S. degree in physics from the University of Central Florida and M.A. and Ph.D. degrees from The Johns Hopkins University, both in planetary science. He has been a professor of physics astronomy at several colleges and universities. He is the president of Methodist College in Peoria, Illinois. He has played a key role in several observatory projects including the Powell Observatory in Louisburg, KS, which houses a 30-inch (0.75-m) Newtonian; the Naval Academy observatory with an 8-inch (0.20-m) Alvin Clark refractor; and he built the Coast Guard Academy Astronomical Observatory in Stonington, CT, which houses a 20-inch (0.51-m) Ritchey Chrétien Cassegrain.